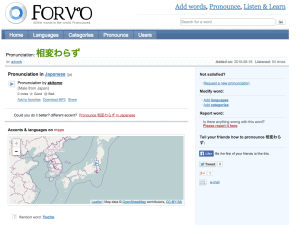 Forvo is a website founded with the aim to collect “All the words in the world. Pronounced”. They are certainly closing in on their mission as far as the major languages go. At the time of writing, there more than 3,000,000 individual pronunciations for 325 languages. This number continues to grow daily, making Forvo an indispensable tool for aiding learners with foreign language intonation. A casual browse of the site for Japanese and Korean words surprised us, nearly every term we could think of had already been recorded. 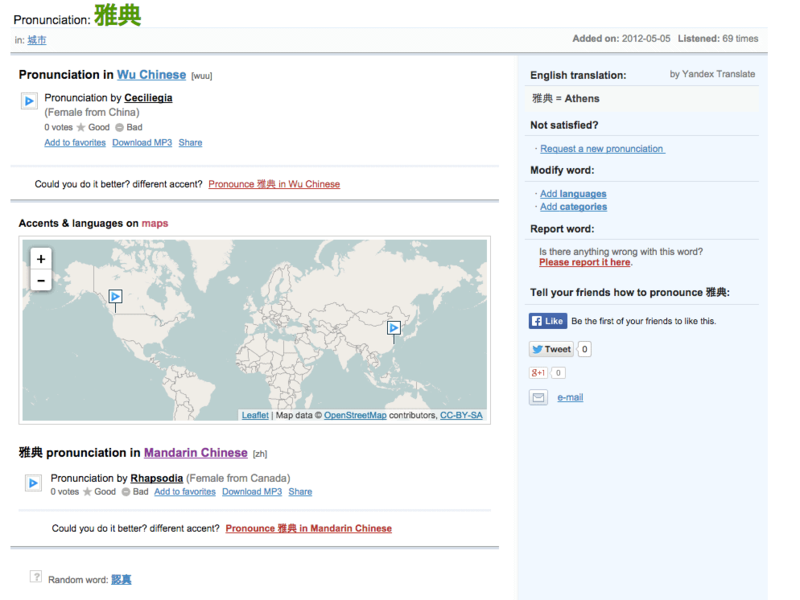 For Chinese there are even various regional dialects covered. Impressive! What’s more, the site is free! I honestly don’t know how they manage it, but I’m glad that this service exists. 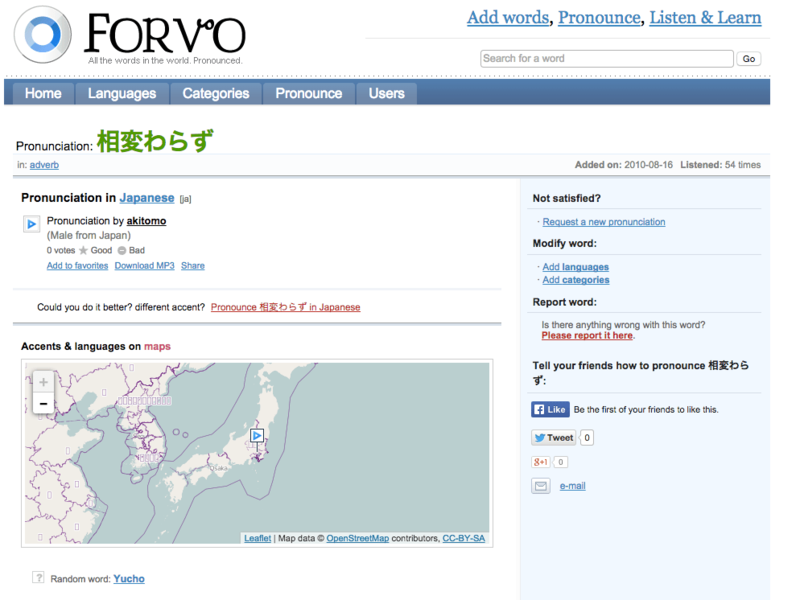 Forvo is immensely helpful for getting instant examples of correct pronunciation from native speakers. 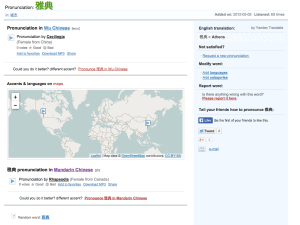 If only we had been able to use this site when we were starting out in Chinese and Japanese! It would have made some of those tricky words and character readings much easier. One thing to note is that, on Forbo, there are no definitions of words given so you will need to use a dictionary or one of our plugins. The beauty of Forvo is the way it makes use of crowdsourcing to cover immense ground. If there is no relevant pronunciation for the word you are looking for, you can simply request a pronunciation to be made. The same goes for words that are badly pronounced or have poor sound quality. Just ask for another sample. In our experience, a new pronunciation is usually uploaded within 24 hours of the request. You will be informed of the new sound file via email. It’s such a great site that I’d go as far as saying that it should be used by EVERYONE who is learning a language. We are not affiliated with Forvo, but we are big fans. It deserves more love from learners. This is the simplest method. When you have a word in mind, navigate to the correct entry on Forvo via the search function. Once you are there, try to pronounce the word as best you can. Always pronounce aloud in your clearest voice. Next, play the audio file and compare how it sounds compared to your attempt. Then try to say the word again. Better? Keep going until you are satisfied. Perfection isn’t the aim here by the way. Decide what is “good enough” for your purposes and stop there. This kind of deliberate practise will pay off over time. With the help of Anki (desktop version), you can make flashcards with the audio files attached. This is truly a language learner’s dream. Having the native pronunciation will not only improve your speaking accuracy, but will also help you to remember new words you encounter. For a more in-depth guide to making audio flashcards, check out Fluent Forever (reviewed here). Know any other useful websites or tools for improving pronunciation in another language? Tell us in the comments section below!